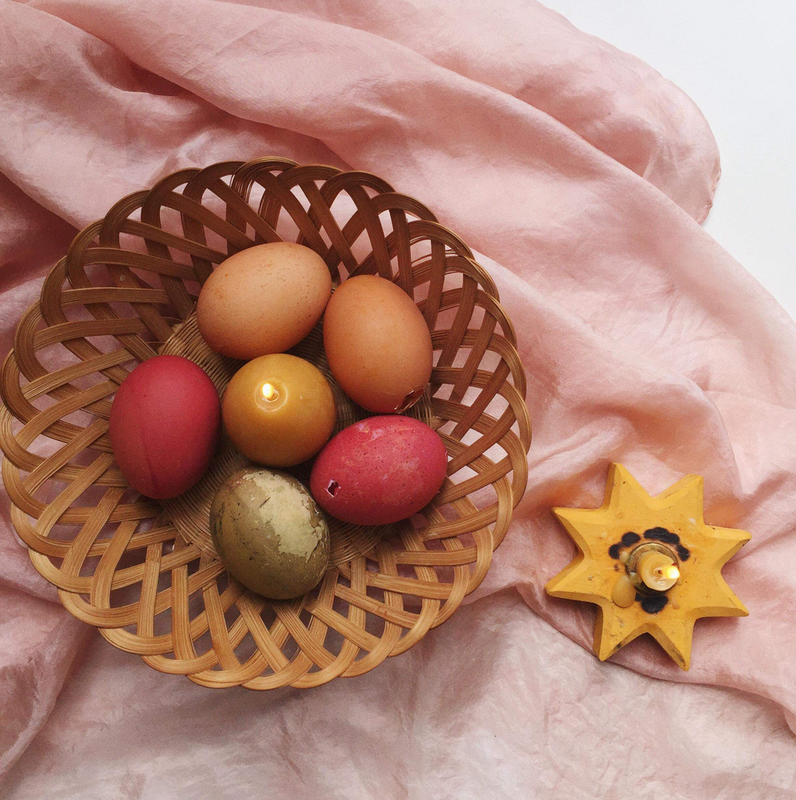 This afternoon I have plans to put out some Easter decorations around our slowly emptying house, and with Easter a week away I thought I’d share some ways to celebrate. With Eilish at nineteen months, there are some we have plans to do over the coming week and weekend, and some are on my wish list for future years as she grows. Decorate for the occasion! I love creating seasonal spaces in our home, foraging for some, making a few bits and buying some choice items that can be used year on year. You could try your hand at dyeing some eggs to decorate a basket, a homemade nest or a few branches in a vase. Myriad do some great plant-based egg dyes which I’ve used, along with following the how-to from my Spring Guide which I’ve put as a little extra below! We also fill the house with spring flowers, daffodils always seem like the most obvious and Easter-like choice to me. A few wooden or plastic animals on a shelf, or a spring book or two are also super simple ways to update. Getting out books is always my first port of call for any and every celebration. We have a few out right now that are more generally spring-themed, like The Story of the Root Children, The Little Gardener and Planting a Rainbow. We are also enjoying some nature books like A Nest is Noisy and - as always - A First Book of Nature. When Eilish is a little bigger I’ll be adding a couple of books that explain the Easter story (as I plan to with a wide variety of different and diverse religious celebrations), and have my eye on the Usborne Easter Story and The Garden, The Curtain and The Cross. Hide eggs in your garden or local park, chocolate, eggs you have dyed or some wooden ones. We’re planning on hiding some dyed or wooden for all the children in the family to find, before they all get given a chocolate treat at the end. Bake some treats together. There’s hot cross buns, chocolate nests, carrot cake, some cookies or animal shaped biscuits. These Easter egg blondies look ridiculously good. You could even bag them all up and hand them out to friends as a thoughtful gift, we always bake more than we can (or should!) eat. Other than it’s religious connotations, to me Easter means two things; eggs and little baby animals. These printables on the life cycle of a chicken look like a sweet activity to do with pre-schoolers, and cracking an egg is a simple and easy way to discover it’s different elements. We visited lambs at our local National Trust last week, and we might visit a petting farm this week coming as Eilish was so fascinated. You could try matching animals to their babies, and introducing the different names for them. Cook a delicious dinner. We usually celebrate most things with a lovely meal, one that we shop together for, and then involve Eilish in the chopping, stirring or mashing. I think we will be cooking a vegetarian roast, but whatever you cook, try letting your child pick an ingredient (or a few more depending on their age) from the supermarket, your garden or a farm shop. Craft. Easter cards are a lovely little touch to send to grandparents, try resist painting on eggs with wax crayons and watercolours, make some tissue paper or printed flowers or needle felt some animals for your nature table. What are your plans for Easter? Are there any traditions that you do every year? Let me know if you get up to anything above! The post above contains affiliate links, at no extra cost to you. Please do consider using them if you decide to buy, it allows us to buy more books to enjoy together! If you’re looking for more inspiration for spring, The Family Collective Guide to Spring is still available to buy. I wrote it to share with you the joy of celebrating each season, and it’s full of things to do, celebrations to enjoy and nature to explore, all to take the work out of planning carefully curated seasonal activities and to give you the tools to create a little bit of everyday magic for your family over the next few months. You can buy the guide here. I’m so pleased to see some of you enjoying the guide with your families.